Black leather with lace up front and wide width available with elastic gores, rubber soles and easy pull on tab. This Fugawee burgundy and stone (light gray) ladies shoe is known as the Sara. The comfort, quality and authenticity you have been looking for are in this shoe making it the perfect fit for any Civil War lady. The shoe is fully leather lined, flat heeled, and fitted as an ankle-high bootee. It has a tapered, squarish toe cap and is made of soft leather on a left\right last. Fugawee has made a slight adjustment by adding another elastic gusset.The shoe has six burgundy buttons on the front but there is no need for a button hook. This Fugawee black ladies shoe is known as Victoria in Black. The comfort, quality and authenticity you have been looking for are in this shoe making it the perfect fit for any Civil War lady. The shoe is fully leather lined, flat heeled, and fitted as an ankle-high bootee. It has a tapered, squarish toe cap and is made of soft leather on a left\right last. Fugawee has made a slight adjustment by adding another elastic gusset.The shoe has six jet black buttons on the front but there is no need for a button hook. This Fugawee bone white ladies shoe is known as the Sara. The comfort, quality and authenticity you have been looking for are in this shoe making it the perfect fit for any Civil War lady. The shoe is fully leather lined, flat heeled, and fitted as an ankle-high bootee. It has a tapered, squarish toe cap and is made of soft leather on a left\right last. 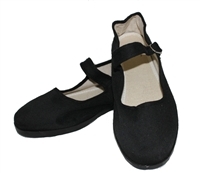 Fugawee has made a slight adjustment by adding another elastic gusset.The shoe has six jet black buttons on the front but there is no need for a button hook.